Moldex3D and Polymers Center of Excellence will co-host the Molding Innovation Day on March 7, 2019 at the Polymers Center of Excellence in North Carolina. 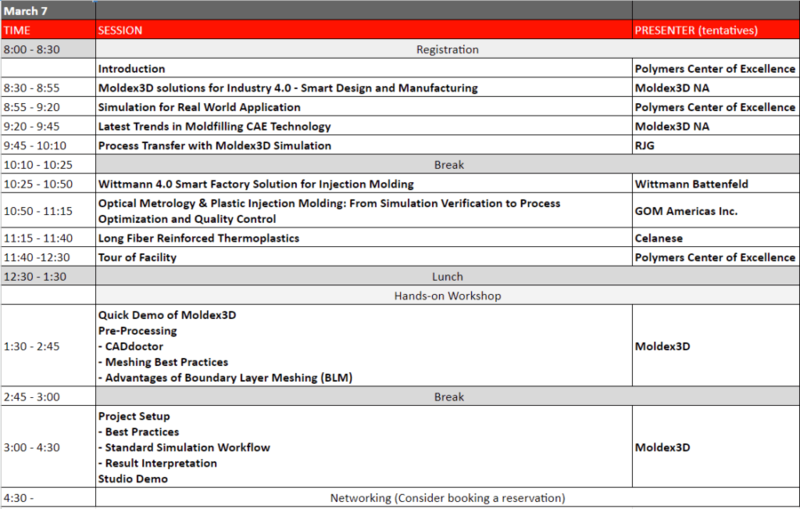 This seminar will centralize around the advances of Industry 4.0 – Smart Design and Manufacturing and include a guided tour of the Polymers Center of Excellence facility as well as a half-day hands-on workshop led by Moldex3D experts. Participation is free. Join us for this informative seminar plus an interactive hands-on workshop to gain skills and knowledge you need to ensure success in your next molding project, and walk away with ideas on how to create smart solutions to address the impact of smart manufacturing. All current non-user participants will receive a 1-month trial license of Moldex3D R16.